Cointeck Review 2018 | Is Cointeck a Scam or Legit Forex Broker? Beware Cointeck is a Non-Regulated broker. It is NOT SAFE to trade. 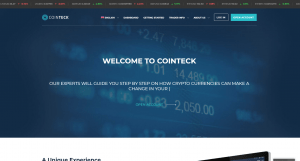 Cointeck is a broker that offers CFDs and cryptocurrency Forex trading. Cointeck.io is operated by CCLR Limited. According to the terms and conditions that can be found on the website, “CCLR Limited is registered in Estonia under the Companies Law, with license to provide financial and crypto services. The license number is 14447182. Its registered office is at 4 Parda St., downtown district, Harju county, Tallinn, 10151”, however, we have checked the register of the Estonian Financial Supervision Authority (EFSA) and there is no record about Cointeck’s license. It can be considered as the main problem with this brokerage. In addition, Cointeck claims to be based in Leicester, UK, but again, it doesn’t hold a license from UK’s Financial Conduct Authority that would let it provide financial services in the UK. We highly recommend trading only with entities regulated by well-respected institutions such as the Financial Conduct Authority in the UK or the Cyprus Securities and Exchange Commission (CySEC). As the safety of funds should be a priority for all the investors as well as brokerages. Well-regulated brokers are required to follow strict rules which include protection of the money in segregated accounts and providing compensation schemes. For example, the FCA insures up to 50,000 GBP and CySEC’s compensation scheme covers up to 20,000 EUR. Check the list of the FCA-regulated brokers.